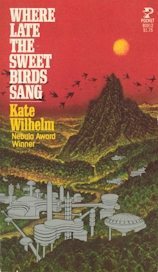 The 1977 Hugo award went to Kate Wilhelm for 'Where Late the Sweet Birds Sang'. When pollution and disease wipe out humankind, a rich little bunch of Americans save themselves. They soon discover they are infertile, and turn to cloning in the hopes that their clones will be able to reproduce as per usual again someday. The clones decide it's NASTY to do the nasty. What will Cosgrove do? What will Cosgrove do?? WHAT WILL COSGROVE DO??? What little I recall was kind of dull but frankly I'd read worse and will again. There's stuff about how nature is good and communities are bad and individuals are great. It does not make me want to ride off by myself in a canoe: I like communities. And the TV series Community. 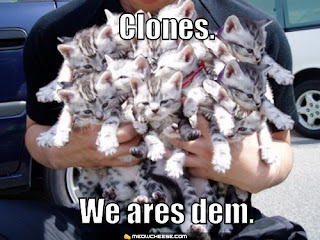 Also, speaking of clones I REALLY like Star Wars: The Clone Wars, and I REALLY dislike Spider-Man: The Clone Saga. 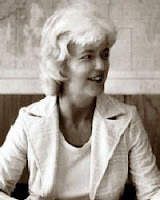 Approximately between them at 'it was o.k.' lies 'Where Late the Sweet Birds Sang'. If you have a strong urge to read it I suggest you do what I did: clone yourself and get your clone to review it for you.